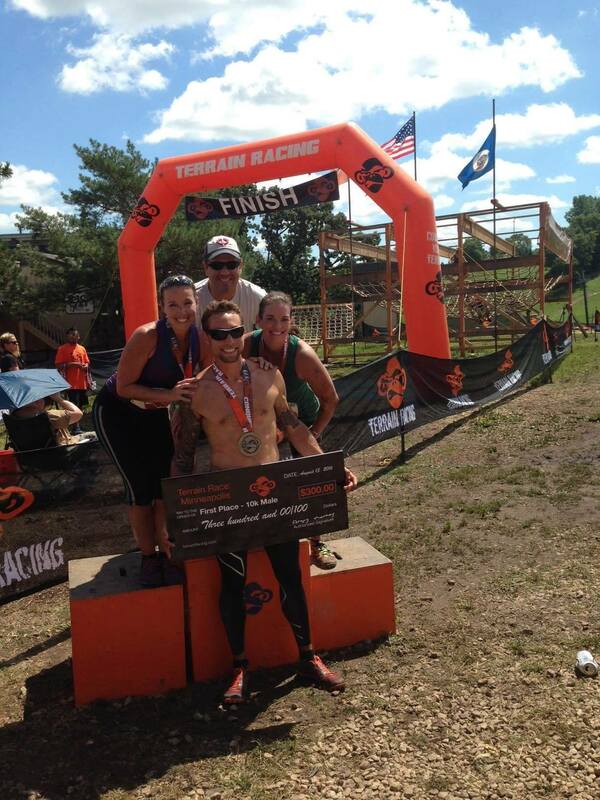 This month I had the opportunity to run the Rugged Maniac Twin Cities. It was the first time I had run a Rugged Maniac event, and overall I was pleasantly surprised. I had heard a lot of buzz over the past few months about how it is a really enjoyable race with a great atmosphere. I went into it looking forward to run a race known for its fun obstacles, but still have the opportunity to run competitively. The morning did not start as smoothly as expected. Despite a fairly late start for the first wave of the morning I was running behind due to road construction that hadn’t showed up when I looked at the route to the venue the night before. I ended up arriving about 20 minutes before my heat took off. Luckily parking was a snap and registration went quickly (and free bag check, big plus). I ran a few strides and stopped to talk with some friends as I walked to the start line. Looking around I saw plenty of familiar faces, which caused me to mentally calculate my final placement. Judging by the people I saw I felt that I could end up anywhere from 3rd to 10th. From what I had heard from the race last year my biggest worry was that there would be some random cross-country runners that would come in and do well enough to drop me out of the top ten. The impression I had before the race is that despite being held at a ski hill, the course would be pretty fast, and the obstacles weren’t generally difficult enough to slow down more pure runners. Fortunately I was proven wrong. The course quickly made its way up a fairly steep climb. My goal was to keep the presumed leader (Mike Ferguson) in sight for as long as possible. I was feeling really well up the first hill and was very close to him, however, once we hit the first downhill Mike kicked it into another gear and created a huge gap with the rest of the field. We then hit a longer, but less-steep, climb, and the pack began to thin out. By the top I was trading 4th and 5th place, and that is where I remained for the rest of the race. From then on things were mostly uneventful, except for the barbed wire-crawl that went through some form of nettles or razor grass, which made for some great picture comparisons later that day. After the first mile I felt comfortable with the gap I had put between 6th place. I felt confident that I could get 5th unless something weird happened. As a result, I paced myself off a guy named Broc (who had ended up 3rd at Conquer the Gauntlet Des Moines where I lost my belt), so I was interested to see how I would hold up. We traded places every once in a while, but kept it close for the rest of the race. My plan had been to keep it close and pick up the pace in the last quarter mile or so. In retrospect I think I had settled on hoping to get 4th after seeing 3rd place’s gap on us. It’s unlikely I could have made it up, but I’m a little upset at myself for not trying. In the end, I crossed the finish line in 5th , getting beat by about 3 seconds. Broc didn’t show up on the results, so he must not have gotten chip timed, so I show up as 4th, but I know it was 5th. I had been a little worried by the amount of balance intensive obstacles before the race, but ended up not having too much trouble. Rugged Maniac had a lot of interesting obstacles, that while they weren’t very challenging, they were a lot of fun. The whole vibe I got was similar to a Warrior Dash, only the obstacles were more fun, they made better use of the terrain, and from what I saw there was a lot more to do in the festival area. I wish I would have had more time to stick around and have fun at the various challenges (and try my hand at the electronic bull), but unfortunately I had other commitments. It was a really fun time, and a good race to open up and focus on speed at. I’m hoping I’ll be able to fit it on my race calendar again next year. Wayback on Saturday August 13, 2016, Terrain Race made its first trip to the Minnesota market (busy time at work, so it took me a while to sit down to write a recap). As an event, I thought it was fun; but as a competition I was left with a bad taste in my mouth. To be honest, the fire that I had in my belly after the Des Moines Conquer the Gauntlet faded quickly, and I fell out of a regular training schedule. I made some specific changes that were tailored to this event though, and I was eager to see how I would do considering I didn’t think Terrain would have the same regional draw as the Minnesota Spartan Race (plus, I happened to know a few of those that had beaten me at Spartan would be racing elsewhere). I went into the race hoping to place in the top 5 for the first time at a race this year and left with a whole mix of emotions that I’m still working through. 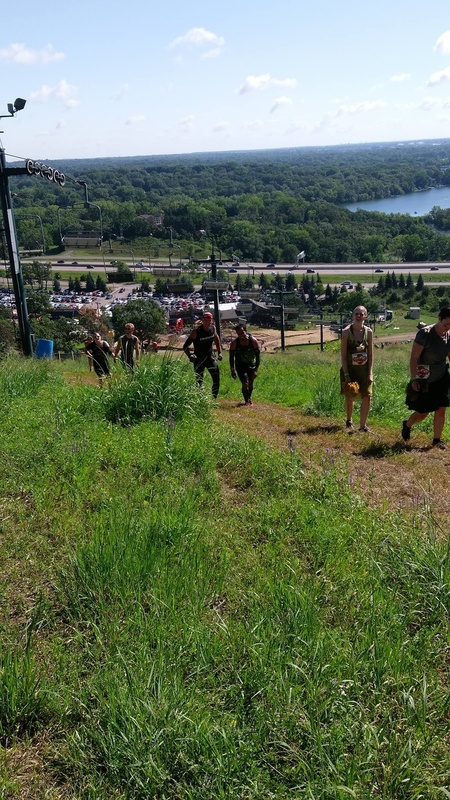 For once, a larger race series delivered on a promise: the venue was actually within 30 minutes of downtown Minneapolis at Buck Hill (aka, Camp Titan to those in the know). It isn’t as large of an area and the terrain isn’t quite as rugged as venues outside of the immediate suburbs, but the tradeoff for an extra hour or so of sleep wasn’t too bad. I had actually trained at Buck Hill quite a bit during the summer of 2014 as it was one of the few places near me to get in some good hills as I prepared for the Vermont Ultra Beast that year (Buck Hill helped me survive… barely). To be honest, I knew the area enough to know that having a 10k and 5k course was ambitious. When I heard the week before that two of the ski hills were off limits due to them installing some year-round skiing surface, I knew they would be cramped for space (as I would come to know all too well by the end of the race). Thefestival area was great. There was a small warm-up rig featuring some of Terrain’s signature “Monkey Balls” for racers to get accustomed to; a set of yard games; great views of multiples obstacles; and unfortunately a DJ that seemed to have limited playlist that got me sick of the song “Uptown Funk” by the end of the day. I personally liked that Terrain let you add on the option to run multiple laps of either the 5k or 10k course with registration for a small fee. I love the competitive aspect of OCR, but for my mental health it is great to go out and run a second or third lap with friends just for fun, and I planned on taking full advantage. I went into the race with a stated goal of finishing in the top 5 overall, but in my head I was hoping that this would be my first time making it on to a podium.The race started off quick and I was keeping pace with the two people I knew would finish ahead of me based on past races. As we got towards the top of the first hill I had the leader in sight and was in a small clump of people between third and sixth. At the top we had a short Wreck Bag carry through some single track. It was camped, but flat, and the Wreck Bag was only 25 pounds so everyone kept up a good pace. We powered up a short hill, believing the two leaders had gapped us enough to be out of sight as we rounded a bend on the back side of the hill. Down a short tube slide and into some rolling mud pits, then we came to where the 5k and 10k split. The 10k went into some single-track mountain bike trails that allowed us to open up some speed. It was flat, and in over a mile all there were in terms of obstacles was a sandbag carry of probably less than fifty yards (and the bag couldn’t have been more than 25 pounds), and a couple teeter-totters. The threeof us that were clumped together once again, but one of the others dropped during the tire drag. This was similar to the plate drag at Spartan, but with a fairly large tire (made more difficult in this instance by the fact that you had topull them up an incline on an uneven surface). Next, we got to the top of one of the larger hills and went over an 8-foot wall. At that point it appeared were supposed to go under a cargo net, but there was some marking tape across part of the opening. Again, we asked the volunteerwhich way we were supposed to go and he told us to go over the cargo net. This required us to around some of the marking tape, so we asked if he was sure and he said yes. We were then directed on our marry way, up and down another hilland we came to the shortest rope climb I’ve ever done, and made our way througha water station. After rounding another hill, the course clearly marked us togo… back over the cargo net. Understandably confused, we asked the volunteerwhich way we were supposed to go and were told to cross the cargo net again.Afterwards, we again asked which way we were supposed to go, and told thevolunteer he had already sent us that way. Assuming we had missed a turnsomewhere else, since this was the way we were actively being told to go by thevolunteer, we sped off again. This was the first point that I began to think we had gotten lost. We went up thehill again and saw the rope climb and asked the volunteer there if we hadmissed a turn; unfortunately he had no idea why we were there again. It wasclear as we passed through this area that we didn’t miss a turn. I started talking with the only other racer with me and we began wondering how manypeople would pass us while we were on this detour. We got back to the cargonet, went over a third time, and decided to go off a different way than the volunteer told us; coincidentally, it turned out to be the right way. At this point, I saw a lot of people in front of us, and while we had joined upwith the 5k runners, I knew several of those I started to pass were running the10k and I had been a decent distance ahead of them. At that point I knew things had gotten screwed up pretty badly. I figured the volunteer had finally been told which way to send people after we had gone through twice and was a little demoralized by the thought of how many people had gotten ahead of us. My pace slackened a little, but I kept up with the other guy I had been going back andforth with, hoping there would be some way to sort things out at the end. We rounded down a hill and started to head back towards the festival area. My GPS watch was still way short of a 10k, so I began to think something was up considering I had thought we ran a considerable amount extra after being misdirected. I entered the signature “Monkey Balls” obstacle next to the personeI had now been trading off between 3rd and 4th for the last few miles and decided that just for my own satisfaction I was going to try to speed throughto beat him in the last few hundred yards. Prior to the race this had been theonly obstacle I was worried about needing more than one attempt to complete. I had gotten slightly more worried after practicing on the rig in the festival area. The balls on the practice rig were worn down and somewhat grimy, makingthem extremely slick and difficult to hold during transitions. With that in mind I approached the obstacle on the course with a little hesitancy, but I felt fairly confident given the training I had been putting in at Ninja'sUnited. I got to the monkey balls slightly ahead of my competitor and found that my worries were unfounded. The balls were still dry and had substantially less wear and tear than those in the festival area. I breezed through andsprinted to the final cargo net and flung myself across with reckless abandon.I crossed the finish line just in front of my competitor. When I got to the finish line I started seeing some familiar faces and quickly learned that things had gone wrong for almost everyone. It turned out that only the first two racers had followed the course to the left after the Wreck Bag carry. I then found out that (as far as I know) only myself and one other racer had been misdirected at the other portion of the course. By the time I had finished only 4-5, had already finished the 10k, and staff seemed pretty aware that they had an issue on their hands. Others had made them aware of the firstmisdirection, but when I brought up the issue later in the race they seemed indifferent. I spent the next hour or so pretty salty about the whole situation. This wouldhave been the first time I had ever finished in the top 3 at any event. I honestly didn't care about losing out on money (although it would have been nice), but I wanted some form of validation for the hard work I've been doing. After doing the course again later I realized just how much of the course had been cut (and how much extra I ran in other places). After seeing this, I don't even feel comfortable claiming I *would* have gotten third because things could have changed so drastically on the portion that was cut. I left feeling cheated out of the opportunity to compete. It isnow 8/23. I know they gave awards to the top 2 finishers. I haven't heard anything else about how they are handling other finishers (despite reaching outa few times). No results have been posted; I went out and self-timed a 5k laplater that day to see where I might have ended up, but haven't been able to check, since nothing has been posted. · Release a course map in advance of the race, or at least have it posted in the festival area. This would have allowed everyone to realize we had taken a wrong turn by the next obstacle rather than ruining the race. · Give volunteers a copy of said map and give them instructions on where to guide participants. · Don't loose the course back so closely on itself. If you go off course you generally know it within about 20 yards since you don't see any markers. This is not the case when you cross directly onto anotherportion of the course (I'd note that this should concern course designers ingeneral because switchbacks lend themselves to INTENTIONAL course cutting. · Communicate after the race. It would be lovely to knowwhat (if anything) is happening with the results. Everything I know has been heard second or third hand. Even if it is acknowledging you have no idea how toresolve the situation, it would be nice to know. Own up, acknowledge the mistake,and vow to not let it happen again. No need to offer explanations, just work to make sure it doesn't happen again. Ultimately, would I run this again if they come back? Probably. There aren't a ton of options for competitive races in Minnesota (especially given the recentuncertainty regarding Battlefrog), plus the price is right and they got apretty good venue. I wish Terrain the best and hope they sort out the very fewissues I had. 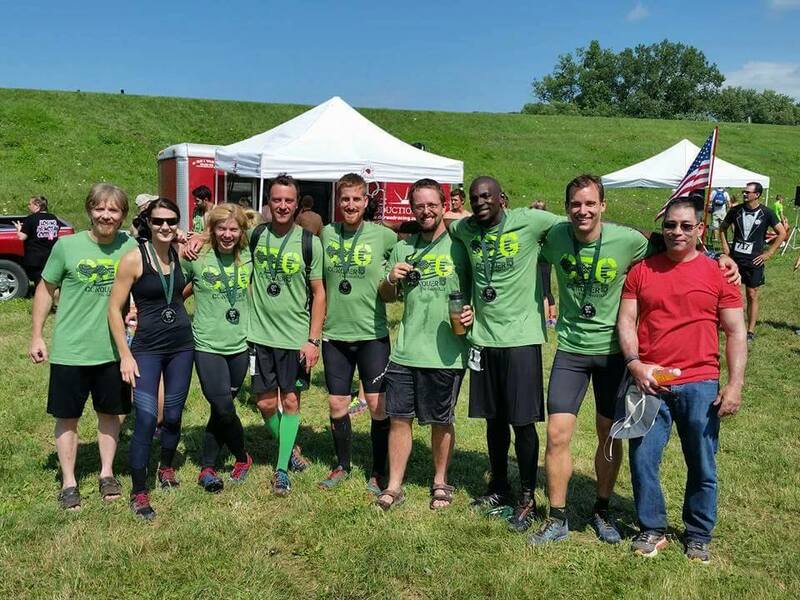 On Saturday July 16, 2016, I had the pleasure of running my first Conquer the Gauntlet (CTG) event in Des Moines, Iowa. I made the trip down the night before with Fellow S&S Dev Team Member Josh Rundquist and North Star Spartan teammate Dan Stowe. As we sped south of I-35 I couldn’t help but think I’d be able to speed along the flat terrain the next morning (I mean seriously, the state is so flat that if the corn wasn’t growing I could probably see all the way to Missouri). We woke up early and made our way to the venue. Parking and registration went smoothly and it was just a matter of warming up and waiting for the starting line. Over the past two weeks I had been thinking a lot about this race and thought it would probably be my best shot at finishing in the top 5 at a race this year. On the positive side, this race had mandatory obstacle completion, which I thought would help me out over some of the faster runners, and I had thought it would be a relatively flat course, which would help me against the people that are better on ascents. I was slightly worried when the obstacle list came out and I saw two possible balance obstacles, but was somewhat relieved when I saw that Pegatron was toward the first half of the race. I had my first opportunity to try a peg board at Ninja’s United, a local gym with a lot of the obstacles you’d see on American Ninja Warrior. I didn’t do too well, but I chalked that up to trying it at the end of a workout and felt somewhat confident I’d be able to handle Pegatron when the time came. 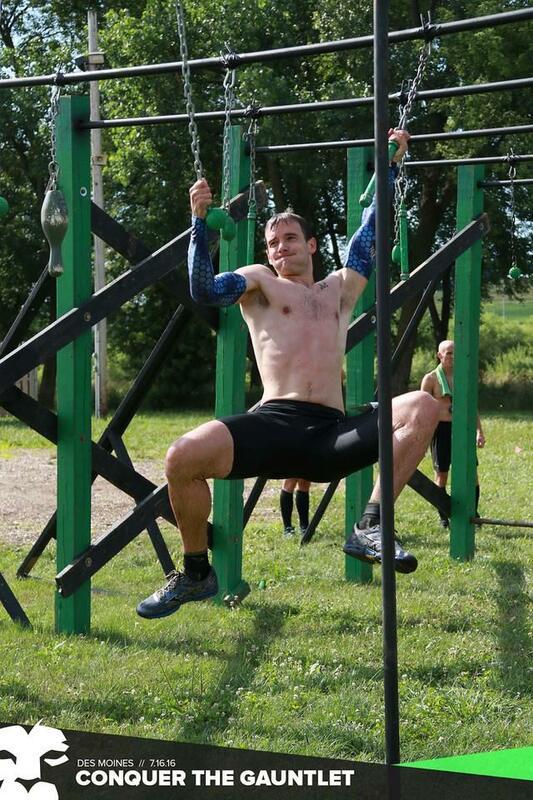 The race started off well and I found myself within the top 10 after the first obstacle (inverted ladder wall). Surprisingly, I made it across the slack line on my first try, passing a few more people, and then we were off into the woods. Once we were in the woods I discovered that CTG had found one of the few places in Iowa with any decent elevation change. We went in and out of a dried creek bed and up and down a ravine. I had anticipated running through some mowed fields and instead got some surprisingly technical trails and creek beds with loose rocks. I passed a few others on some longer hills and by my count had moved up to 5th by the time I got to the Z-balance beam. I got 2/3 of the way before slipping on my first attempt. Then only a few steps. Then 1/3 of the way. I was able to try several times before anyone else had come through, and luckily a few of those ahead of me were also having difficulties. At one point, I followed the lead of another racer and tried to lay down and scoot across the beams. Unfortunately my knees touched the ground and it was back to the beginning. Eventually a larger part of the pack had come and it was fairly demoralizing to see a couple people get through after just a few attempts. Finally, after 15-20 minutes of attempts I made it through and took off at a sprint to try to make up some time. During the next running section I bombed all the downhills I could to make up time. I had some minor skids down into some creek beds and at one point a small tree allowed me to keep my balance instead of going head-first onto a pile of rocks. I emerged from the woods relatively unscathed and had worked my way back up to the top ten or so. At that point I knew that my legs were going to allow me to catch up as long as I could make it through the obstacles. On my first attempt I got about halfway through before my momentum gave out and I was stranded hanging by one arm. I quickly got up and tried to go on another side so that my dominant hand would be in front. I got about as far, but my arms gave out again. I listened to other people and made some minor adjustments with technique, but wasn’t getting much farther. With each attempt my arms were getting more taxed and it took longer to try to recover before my next attempt. At one point I was able to get far enough that I thought I’d be able to get my feet onto the next set of foot holds, but I was about one hole short. Overreaching caused my swing to get off-kilter and I fell again. After over 30 minutes of attempts I was getting consistently less far on the wall and was demoralized by the amount of people that were making it through on their first or second attempts. I talked with Josh (who had made it to the wall before me) and we decided to give it one last shot before giving up out belts. Unfortunately neither of us made it, so we put our tails between our legs and turned in our belts. This marked the second time I DNF’d a race (the first being the Surf the Murph 50 Miler last fall that I attempted after basically taking 2 months off of any training). My mood had soured, and with it my legs had turned to lead. Josh and I slogged through the remaining obstacles. I attempted to enjoy the terrain and focus on doing all of the remaining obstacles well. I made it through everything else on the first attempt, with the exception of the Tarzan Swing (CTG’s version of the Rig) which I got on the second try. I was incredibly disappointed with having to turn in my belt, and ended up a disappointing 43rd as an unofficial finisher. After a long period of beating myself up, I decided to accept what happened and analyze it. In attempting a new event I faced things that were completely new to me and exposed some weaknesses in my training. Rather than having a pity party I have recognized what I need to do to be ready for my next race and for CTG events next year (needless to say, I’ll be making my own peg board and balance beam to practice on). Every once in a while you need something to break you down in order to light a fire in you. The whole point of obstacle course racing, at least in my mind, is to find your limits and push beyond them. Well… limits found. Time to work on pushing beyond them. Pictures are from the official CTG photographer and provided for the article by Kevin Hill. 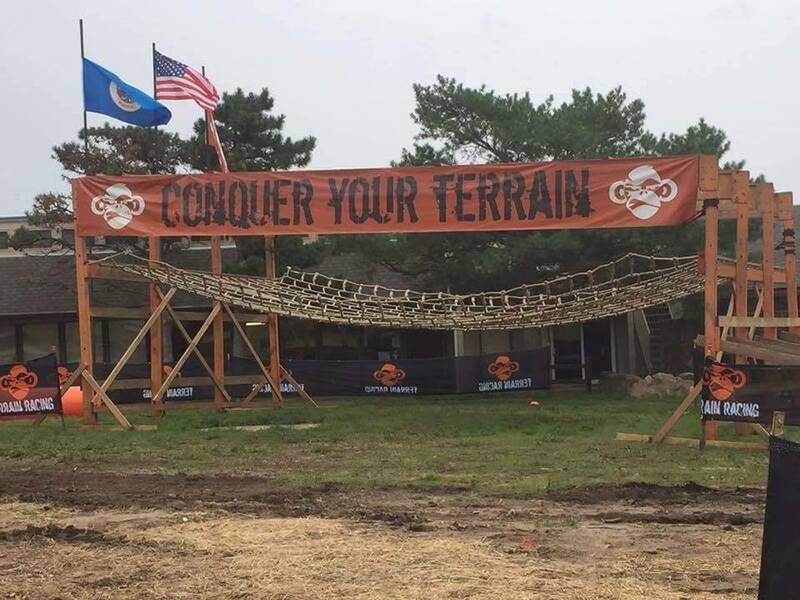 Fast forward, another 12 hours of driving through the night and we made it to Mustang, OK, the site of Conquer The Gauntlet Oklahoma City, the final day of OCR America. The drive through the night was rough with Sty and my father both being tired from the week and the long drives. They made it as far as they safely could and I took over driving duties for the final two hours. I made it to a Starbucks about 30 minutes from the race venue and switched off one final time with my father. I can honestly say, I am very happy we made it safely to our destination. Things were looking a little rough there at some points during the overnight drive. We arrived at CTG OKC about an hour and a half before the start time of the first wave, which is the time I would have shown up if I was staying locally. Not bad timing for a 12 hour drive. I was glad to be at CTG OKC, not only because it was the final day of OCR America but also because the CTG races are like family reunions for me. The other athletes and friends I have that attend CTG events means I already know a good chunk of the crowd. I started in the elite wave, hoping that somehow I would have the strength to magically make it through Pegatron (their signature peg board obstacle) and that everyone else would have a bad day. Maybe if the stars aligned, I could someone still end up with a high finish even after six days of OCR. This turned out not to be the case. The males of the CTG Pro Team performed in dominating fashion finishing 1st (Matt Campione), 2nd (Nathan Palmer), 3rd (Bryce Robinson), 5th (Lucas Pfannenstiel) and 7th (Cody Peyton). I promised myself I would take two attempts at obstacles and no more, since my goal was mileage not 100% obstacle completion. Unfortunately, my hands were sensitive to the touch from the week of OCR America. I reached the Tarzan Swing (CTG’s rig) failed immediately because it hurt to hold the awkwardly shaped grips. I tried one more time and made it half way before deciding, I had bigger goals today than keeping my belt. However, upon reaching Pegatron, I magically summoned some internal strength and made it through without issue. I was pleasantly surprised and continued my race. For the second time of OCR America, I felt like I finally received a break. Although the obstacles were challenging (as CTG always is), the course was very pleasant for multi-lapping. It was warm and very dry, which meant that even with lots of people running multiple laps, the course remained runnable and dry. Unlike previous courses I have been on, which get so muddy it becomes hard to run, the terrain and path was fairly well groomed. I stayed at a 1 hr 30 min pace for all three laps of the slightly over 4.5 mile course. Joel Herrington was a huge help pacing me through all of laps 2 and 3. The final lap I invited anyone who was still around to join me. The result was every member of the CTG Pro Team plus many of their friends. The final lap turned into a big party with live streaming of the event, along with athletes carrying a 60 lbs. sandbag and a giant log attempting to complete all the obstacles. The live stream video shows some impressive accomplishments. The party slowed our pace significantly, so Sty, CTG Pro Nathan Palmer and I kept on cruising to finish the lap before CTG completely shut down the course. Nathan paced me for the final two miles of OCR America, leaving me to cross the finish line by myself. I crossed the line exhausted and happy with the end result of OCR America. I made the decision to purposely cut my final mileage short, so I could have a finishing group for the final lap and some people still present for the completion of the event. Conquer The Gauntlet provided the perfect ending for a week long journey. After heading back to my hotel room to take a nap, I woke up feeling absolutely terrible. My body had been blocking out pain for seven days so I could continue to perform. Now that it was over, those mental blocks came off and everything hurt from the bottoms of my feet to the muscles in my upper body. The event was an awesome experience overall and provided a new challenge for me testing my multi-day endurance capability. Besides a physical challenge, the added stress of publicizing on social media and providing logistics for events that I was running added to the layers of complexity. Without my pit crew consisting of my dad, wife (and baby) and Sty, the event would not have been possible. There was just too many tasks that had to be done for OCR America to run effectively. Without all the people participating and pacing me, I would have been running much slower and it would have been much more mentally challenging. If you like/respect/appreciate all the work I did, please take a minute to donate to Folds of Honor via the link. This is an abbreviated excerpt taken from a working copy of my OCR America digital book, scheduled for release in 2017. The event, OCR America, would have abruptly ended here if it was not for my pit crew. Sty, drove 12 hours through the night to arrive at the site of Dirt Runner just outside of Chicago, IL. This was a task that would have been impossible for me to accomplish based off how tired I was from the week. Dirt Runner is a unique course unlike most of the other permanent OCR facilities because they actually move a lot of their obstacles around for different races they hold throughout the year. 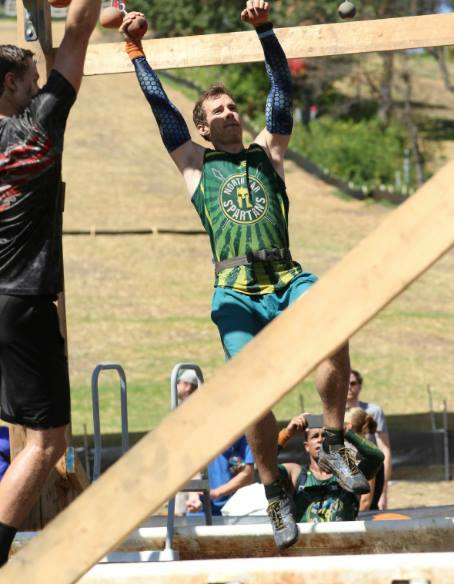 Besides a standard 3-5 mile race, they also have a couple of variants like the DRX Games (1,000m short course OCR), night OCRs and an area specifically for ninja warrior type training (pegboard, warped wall, salmon ladder and cushioned rolling balance logs). Their venue has also been used in the past by race companies such as Spartan and BattleFrog. It was another hot day on Day 6 and having slept in the car the night before I was not very well rested. Takis, the race director for Dirt Runner, had setup his course for the upcoming DRX Games, so I had to adapt to this new setup. 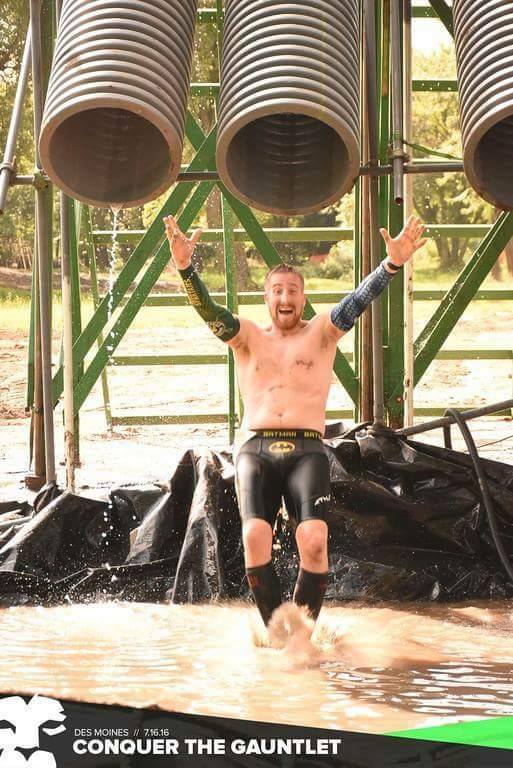 It meant, I would be running large sections of the course in the woods hitting the permanent immovable obstacles, then come back to the main area where I would run through a gauntlet of about a twenty five obstacles over 350m of terrain. 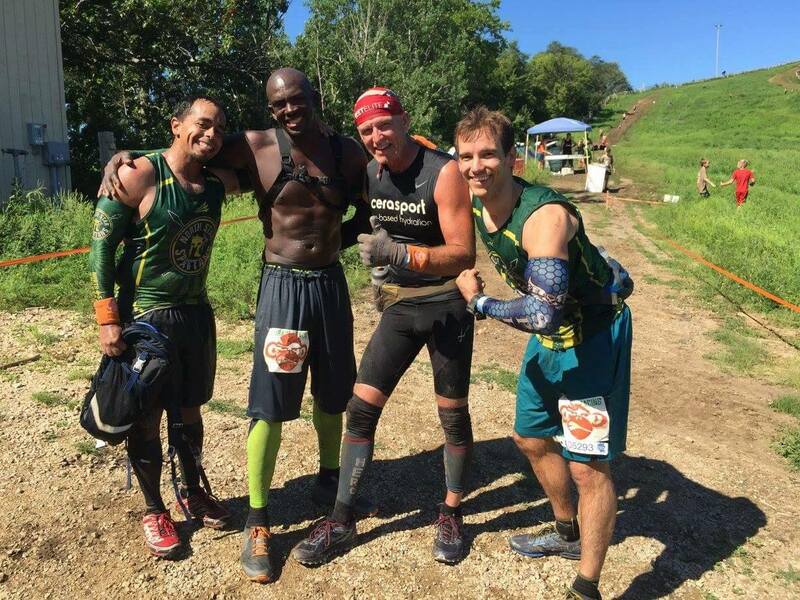 If you are a big fan of Spartan Races, then you would love Dirt Runner. They had a lot of carries including logs, cement blocks, Atlas stone relays and buckets. They even added a couple of twists to some favorites. For example, the Atlas stone comes in three different sizes and for DRX games you are required to run around the far side of a flag with each stone. The log carry, although fairly short, required crossing a small pond in the middle of the carry, which had water that was almost up to my shoulders. The bucket brigade is called the Dirty Bucket List, which requires carrying two buckets Jerry Can style for a small loop and immediately doing another loop with just one bucket. Finally, the Ares Spear Throw is a double or nothing type throw. If you miss the first spear you can do 30 burpees or take your chances with spear number two. If you land spear number two, there is no penalty…but a second miss means a 60 burpee penalty. There was also several crawls that tested both the mind and the body. I have never been claustrophobic, but there were several tunnel obstacles that put this to the test. One tunnel obstacle was super long and downhill, another was also long and had pits mid tunnel, which were hard to see in the dark. Finally, one of the drainage pipes we went through was so full of water there was just a tiny gap of air at the top. Normally, if the situation was the same on race day, this drainage pipe would have been closed….but being bold, I decided to put myself to the test. On most laps, my head completely submerged for the last couple of feet of the obstacle due to the level of the water and lack of space in the drainage pipe. I would be remiss, if I did not mention the unplanned obstacle that scared me most, our encounter with our furry friend. On lap 3, Sty and I ran into a baby raccoon that was blocking the trail, which also had large mud puddles. Since I was exhausted from six days of racing, Sty took lead. He grabbed a (not so) long stick, and tried to scare it off. The baby raccoon hissed and barely backed up. Sty made his way across the puddle and continued to swat at the raccoon. With Sty swatting, I made the leap past the raccoon. We both ran off with an angry baby raccoon sitting in the trail. Back to the obstacles manmade obstacles, my two favorite obstacles were the unique Tarzan Swing, which involves swinging on a rope to a net above water, and the final obstacle. The final obstacle is a series of telephone poles sticking out of the side of a hill. Both of these obstacles are very visually appealing to spectators and a lot of fun for participants. It was a low participant day and for first time of all of OCR America I ran laps by myself. After finishing lap one by myself a couple of other participants showed up to run the course but were out on the course before I started lap two. Sty, after a brief 1.5 hour nap, was back on the course and ran the final two laps with me, pacing me through the finish. On Lap 3, I sustained my first injury of OCR America. After climbing out of shin deep mud, I slipped on an uphill balance beam landing on my hip then bouncing and hitting my shoulder and head before I hit the ground. It was painful, but after a quick assessment decided it would be achy for a while but would not stop me from walking and/or running. The wooded parts of the course had so much technical terrain that running was almost impossible. I ended up walking a lot of the course and had a to get off the course between four and five p.m. to make it to the next venue, resulting in a low mileage count for the day. It was the most technical terrain I would encounter all week. We finished after I had spent about 8 hours on the course in time to shower and drive directly to the next venue Conquer The Gauntlet in Oklahoma City. The nicest part about Day 5 was the fact that we stayed in the same hotel for two nights in a row. This helped reduce the stress of traveling to the next venue. The Newby’s actually have two courses on their property. The first, Mud Gauntlet, is their obstacle heavy course. The second, Extreme Ravine, I would describe as extreme trail racing. Instead of the standard affair of manmade obstacles the challenges at Newbsanity Extreme Ravine are mostly natural. To stick with the OCR focus though, Jarrett brought over some manmade obstacles such as teeter totter balance beams, tires for flipping, sleds for dragging and a net to crawl under. The rest of the obstacles consisted of fallen logs, rope ascents and descents out on the course. If you have ever raced the OCR World Championship when it was in Ohio (also the site of Mud, Guts and Glory along with BattleFrog Cincinnati), the terrain was very similar. There was lots of steep climbing and descending. This was the first day, where I felt like I got some sort of break. The lack of intensive upper body obstacles meant my arms and back could heal for the day. However, it was clearly no rest for the legs. The three mile course had around 850 feet of elevation gain per lap. Turnout was lower on Day 5 than Day 4, which was not surprising. However, there was a handful of athletes like Jen Reis, Percy Blank (the barefoot runner), Sara Korba and Jarrett Newby that came out for a second day of fun. Jarrett was the star of today pacing me through all seven laps (21 miles). We had some great discussions about training, World’s Toughest Mudder, the future of OCR, why collegiate athletes are not as prevalent in OCR as one might think and other random topics. While my body felt capable of running several more laps, I knew we had to get on the road to make it to Day 6 in time. The drive from Newbsanity in Binghamton, NY to Dirt Runner in Marseilles, IL is about 12 hours. Therefore, I called it after seven laps so I could change and get into “my bed” aka the front seat of the van. Jarrett was kind enough to let me use the shower in his house prior to getting on the road and off we went towards Day 6 of OCR America. I repacked all my race apparel in my HYLETE backpack, which was awesome for this trip. It has a ton of pockets, an expandable bottom to add shoes and specific space to safely carry my computer. My wife even carries one and uses it as a baby diaper, snack and clothing bag for all of OCR America and all my races. After my long Day 3 (33 miles and 11 hours on the course), I was happy we had decided on a noon start time for Day 4 Newbsanity. 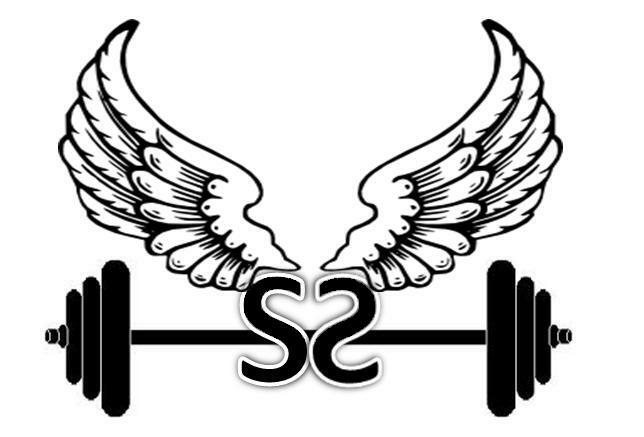 The noon start time was picked so that athletes would arrive to Newbsanity on Wednesday evening, which coincided with a weekly training session held by the owners Jarrett Newby and his father (also named Jarrett Newby). I did not know much about Newbsanity: Mud Gauntlet prior to my arrival, so when I heard it took place in someone’s (Jarrett’s) backyard, I was suddenly concerned. The pictures online made it look like a legit obstacle course, but what kind of course can you build in your backyard? The answer is an awesome one. The Newby’s have created big race quality obstacles on a course that literally surrounds his house. 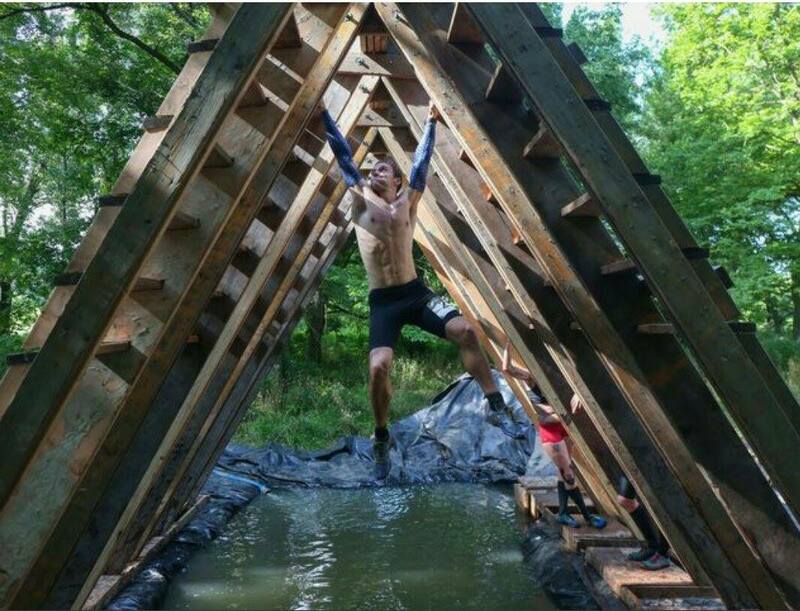 The 3 miles course has 25+ obstacles and the obstacles are tiered. This means there are challenges for all levels. Even the rig is tiered, but is still “mandatory completion”, which initially sound impossible, but the “easy” level involves unstable balance beams hanging from ropes. “Easy” is really a misnomer, because it is not that easy, but is instead lower body intensive so anyone can get across, but it just takes some time. Besides a rig, Newbsanity also has some awesome obstacles including a ¼ pipe, which they still managed to create tiers for difficulty. Based off which tier you use, it determines how many tires you will have to carry for the next obstacle (zero, one or two). 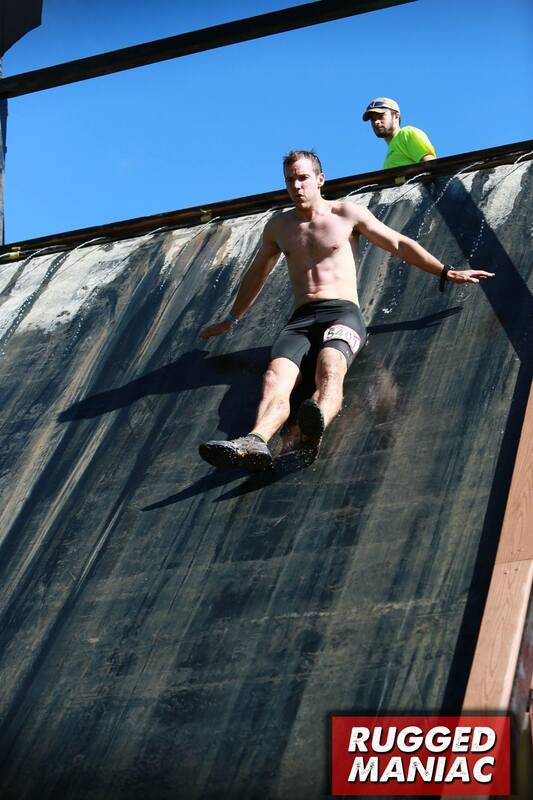 My favorite obstacle was a balance beam over water that when into a wall traverse. Another great one was series of angled walls, which was both visually appealing for pictures and challenging for the participants. The walls were about 8 feet tall for the hard lane but they also had an easier lane with four foot walls, but the easier choice required a sled drag afterwards. During Day 4 I did a Mud Run Guide Snapchat takeover (Sty did all the camera work), which gives a great rundown of the day’s events including pictures and video. Check out the 24 mile race recap in under 9 minutes via the video below. When I imagined what OCR America would look like in reality, Newbsanity is what I imagined. We had 20+ participants running at all different times starting at noon. Some participants just did a lap, while others, like Percy Blank ran 7 of the 8 laps I ran….but he did it barefoot! I was more impressed with his performance than mine on Day 4. Neil Cary, from Day 3, came out for another multi-lap day logging an impressive 15 miles of Newbsanity after his 22 miles of the Viking course. I got to run with a different person almost every lap and hear the different stories of people’s OCR history, personal stories and their likes/dislikes about the sport. Newbsanity offers a great training and race venue from open wave competitors to elites like the owner Jarrett (8th at World’s Toughest Mudder 2014) and Katie Vitali (podiumed at BattleFrog and Savage Race the week before and after OCR America). Check the Newbsanity.com website for the latest on their events. 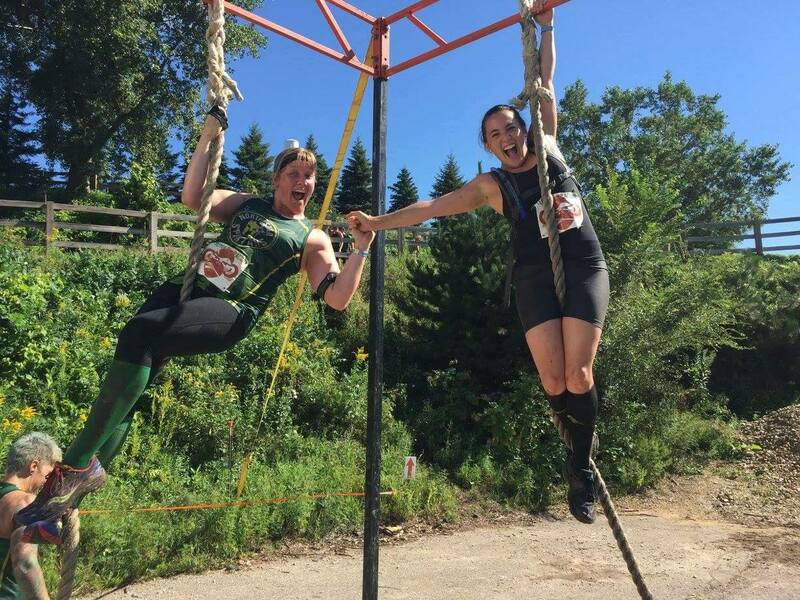 In early September is their Zombie OCR and Commando Cup (a combination team and OCR event), both which sound like a ton of fun. All of their events contribute to a point series, which allows them to crown an overall winner and age group winners based off race results and frequent participation. Post Shale Hill, I was ready for a break. My body felt rough on the inside and looked even worse on the outside. Luckily, I had prepared for Shale Hill and wore gloves almost at every obstacle minus a handful that I went gloveless for better grip. The end results was sensitive hands and one ripped open callus. Compare that to Jordan (who was about to start his 4th day of OCR having covered 60 miles over the last three days) and Sty (20 miles over the last two days), who only wore gloves for part of Shale Hill both had multiple open wounds on each of their hands. As I left Shale Hill the day before, I talked to the owner Rob Butler about the Viking Course. Agh, my heart sank a little. Rob’s impression of easy does not always line up with other people’s impression of easy. After all, this is the man who created Shale Hill and some of the ridiculously difficult training products from Sinergy Sports. We arrived at Viking a couple of minutes late and got ready to run. Viking is unique because it is an all-inclusive family resort. Families pay a flat fee which includes on site hotel, food and family activities (including access to the obstacle course). There is also a golf course on site, pre-organized events and in the evening they do rides on a half tracked Army vehicle across the back trails. If you come there for a race weekend, it is awesome because you can race, walk back to your room, shower and then go back out to enjoy the festival area. Talk about low stress. Jordan said he was going to arrive later and Sty planned on sitting out the first lap or two. Instead, I had the pleasure of running with Neil Carey. 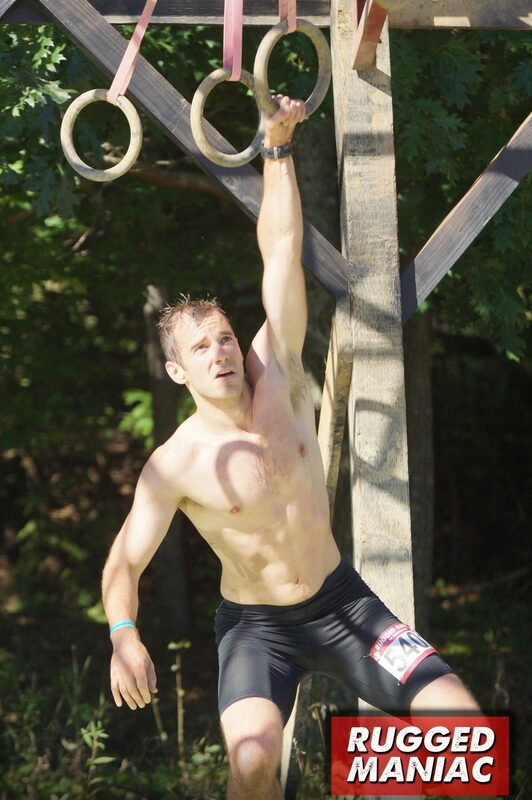 Neil is a veteran of numerous Spartan races, was working on his Trifecta, had run Viking OCR several times and still enjoys cross training using strength based competitions like strongman. His knowledge of the course proved to be priceless as we navigated the woods and talked about upcoming obstacles. The obstacles clearly had a Rob Butler flare to them, but were much more reasonable than Shale Hill. Both in frequency and difficulty level. 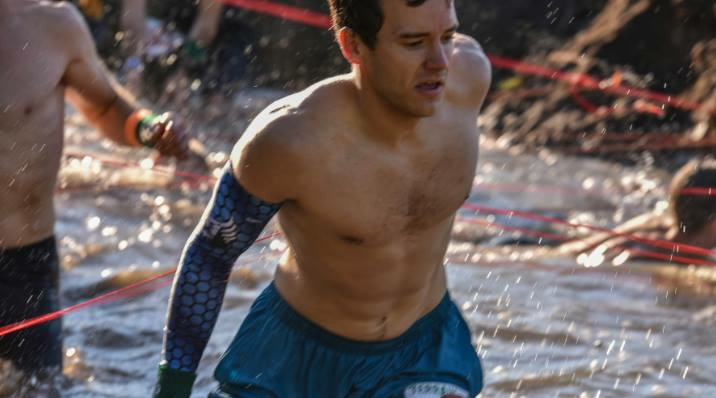 If I had to pick one course I would be most interested in coming back to race on, it would be Viking (and I have my chance on July 10th…if I wasn’t still recovering from OCR America). The difficulty of the obstacles was hard but not over the top, the trail proved good sections you could get some running speed but also had some technical sections and the course was a good length (5.5 miles). I was thankful to finally be in a course that had lots of shade after baking in the sun on Days 1 and 2. My favorite obstacles for the day were the monkey bars (which go from flat to incline to decline then back to flat), the floating logs (which appear easy at first until you hit the section that has moss growing on it) and the maze of balance beams which has a traverse rope in the middle of the obstacle. What was funny, was early in the day I said “This is a great beginners course”, until I realized it just seemed that way because of how difficult Shale Hill was. 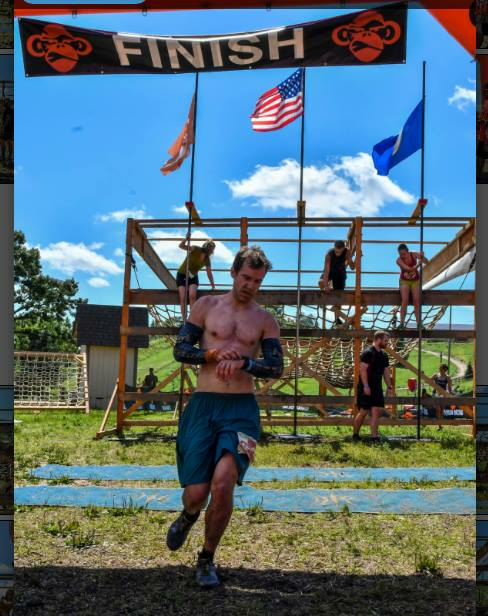 In fact, Viking is a course that is harder than Warrior Dash, Tough Mudder, Rugged Maniac and even some of easier BattleFrog races I have completed. It is not an easy course by any means and includes several climbing obstacles including a rope ladder, a beam climb, monkey bars, rope traverse, tall rope climb and so many walls it tested my patience after multiple laps. 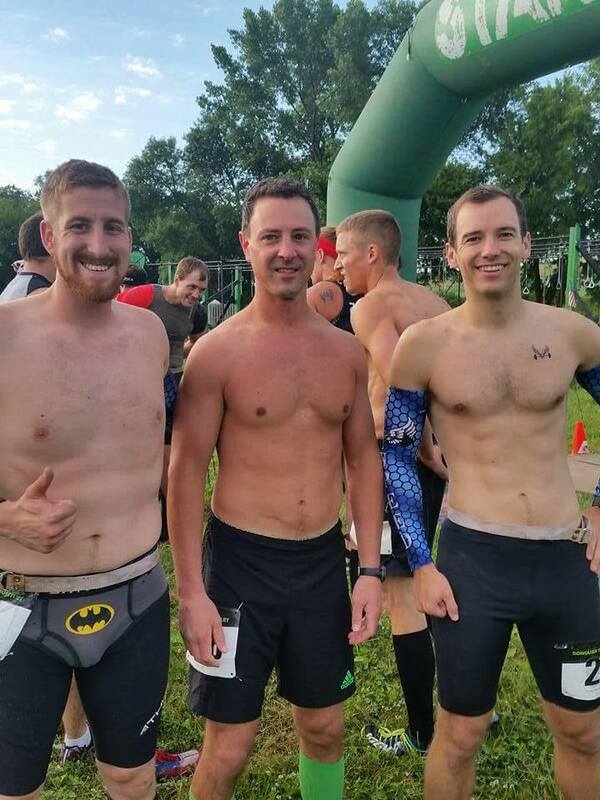 For clothing choices, I was back to my standard obstacle racing attire of sleeves to protect the arms, no shirt to vent heat, spandex shorts to avoid holding water, compression socks to protect the calfs and Under Armour Speedform XC shoes. UA’s Speedform XC shoes don’t have very good traction but for Day 3’s course it was not an issue. My pacer, Sty, chose to go with similar attire but chose the INOV-8 X-Talon shoes and Mudgear’s socks. Due to the two days prior of not reaching 26.2, I decided to stay on the course longer on Day 3. I multi-lapped until I hit 6 laps total with a grand total of 33 miles. Neil ran with me through most of it, Sty jumped in for couple of laps and Brianne Kuchera paced me through to the finish on the last couple of laps. She was fresh and I subconsciously matched her jogging pace making laps 5 and 6 my fastest laps (besides lap 1), which was great because the sun had started to set by the end of the day.